There are many names for these playful and inquisitive little tree squirrels which we find in South and Southern Africa. Tree Squirrels, Smith's Bush Squirrel, Yellow-footed Squirrel are all covered by the scientific name of (Paraxerus cepapi). Again we see the importance of using the scientific names where ever possible, together with its 'local' name to clear up any local or regional colloquialisms and thus ensuring the learner is clear on what is being discussed and or taught. That said these delightful inquisitive tree squirrels are a common sight in South Africa, in fact I have a family of them living in our 'chimney' on top of my roof at home. We often see them clambering around searching for food, chasing and generally having a good time with each other. Its part of our daily lives, my wife says 'the tree squirrels did this' and the 'tree squirrels did that' today. Tree squirrels are small 'diurnal' (active during the day) creatures, only about 350mm long (12inch) and weigh in at only 200g (7 oz) generally with a rusty/buff colour body and white bellies, although the body colour sometimes can have 'regional' slight differences but all have long bushy tails which are extended out behind them. These generally 'arboreal' (living in trees) tree squirrels spend a lot of time on the ground foraging for food, which as they are rodents would include insects, but as you would generally expect to see them eating nuts, seeds and fruits. Male tree squirrels are fiercely territorial and the families spend the nights together usually in a hole, in a tree. Tree squirrels use a defence mechanism when under threat, which is what is called the 'mobbing' tactic. This usually means all the members of the colony make harsh clicking sounds while they flick their tails, building up momentum and gradually getting louder until the intruder and or danger has passed. 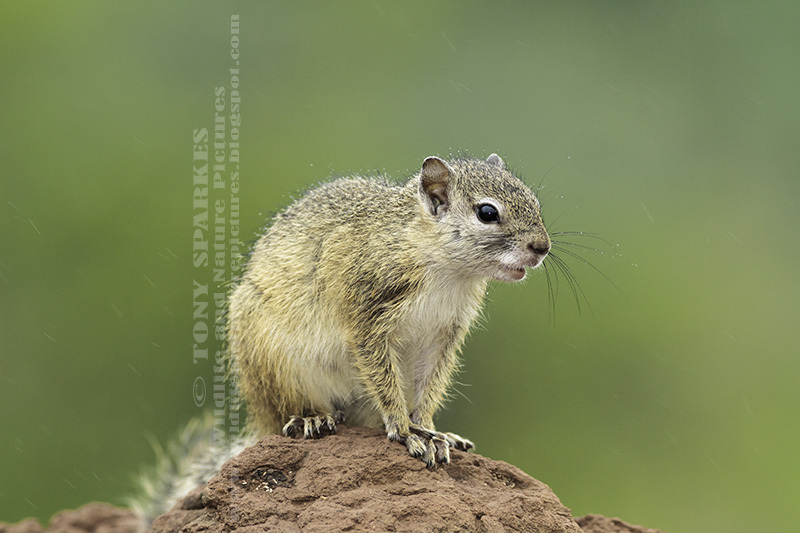 The tree squirrel in the picture below was sat on a dirt mound in South Africa's Kruger National Park loudly screeching and clicking at me while I took this photo, he only stopped when I left.